Widely known for its many medicinal benefits in traditional and folkloric medicine, the ginger root is the most commonly-consumed herbal condiment in the world. The spicy-sweet flavor and aroma of ginger are most often encountered in Asian cuisine, but while ginger is a popular flavoring agent for food, it is also frequently consumed as a beverage. An excellent way to access the beneficial ginger effects is drinking it as a beverage. Ginger is highly praised in traditional and folkloric medicine for its antiemetic effect, and it is commonly used to treat gastrointestinal issues, motion sickness, and pregnancy-related nausea. On the other hand, the use of ginger for inflammation has prove quite effective when it comes to ease headaches, migraines, and arthritis, as well as for relieving muscle soreness caused by intense physical activity. In addition, drinking ginger for upset stomach is a popular practice that has been shown to be effective in managing many gastrointestinal symptoms, from mild discomfort to extreme nausea and vomiting. Drinking ginger tea is thought to be useful in treating suppressed or irregular menstruation, while ginger ale is often used to soothe nausea and stomachaches. Ginger drinks can take many forms. 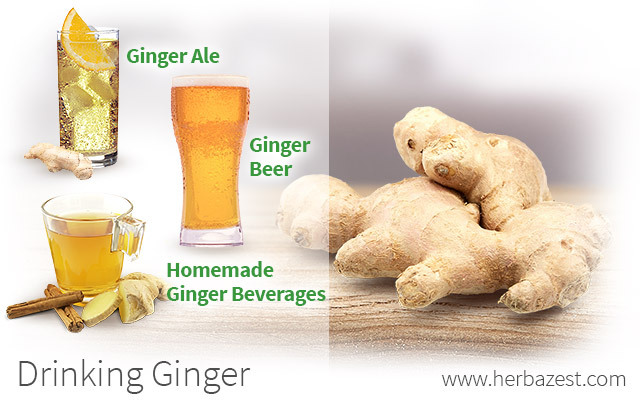 However, some ginger beverages that are widely available for commercial purchase include ginger tea, ginger ale, ginger beer, ginger energy drinks, and ginger juice. Ginger beer originated in the mid-1700s, in England. While first brewed at home with a very low alcohol content, ginger beers quickly grew in popularity and were soon exported around the world. On the other hand, ginger ale has a long history of use as one of the oldest soft drinks in the United States, first available for public purchase around 1986. Both ginger beer and ginger ale are consumed plain or mixed in cocktails, such as the Moscow Mule. It is also possible to concoct homemade ginger beverages. While one of the most common and easy ginger drinks to make at home is ginger tea, most other ginger beverages - such as ginger water, ginger juice, ginger ale, and ginger beer - can also be made at home. Some of the easiest ginger drinks to make include ginger tea, ginger water, and ginger juice. For ginger tea and ginger water, simply steep fresh or dried ginger in hot or cold water respectively until your ginger drink reaches the desired strength. The steeping process for ginger water will take significantly longer than for ginger tea, and should be left to chill for three hours or more. For ginger juice, use a juicer or grate fresh ginger root and squeeze it through a cheesecloth to obtain a concentrated juice. However, you can also blend chopped fresh ginger root with cool water and filter it through a fine sieve or strainer to make a more diluted ginger juice. You can also make a simple ginger dessert beverage by pairing ginger ale with vanilla ice cream. Even when taken in a drink, ginger consumption should not exceed the daily limit of four grams of ginger root for adults and one gram during pregnancy and breastfeeding. Be sure to consult your doctor concerning the right dosage for you. Ginger should not be given to children under the age of two. From a soothing tea to a refreshing beer, there are many ways of drinking ginger to reap the many nutritional and medicinal benefits of this popular herb. Whether making your own or choosing among the many commercial brands on the market, it is very easy to incorporate ginger drinks into your diet.